Application Story – FDA/Washdown System Excels with Special Linear Motion Shaft Assembly from LM76! 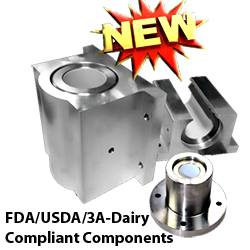 E. Longmeadow, MA – — Linear Motion – Application Story – Dairy machinery manufacturers are under intense scrutiny by FDA inspectors when it comes to FDA material and caustic washdown compliance. 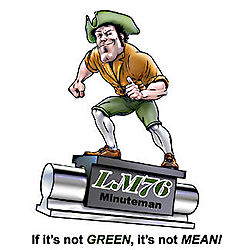 Recently, LM76 was called by a large US dairy packaging company to review a problematic portion of their filling line. After each shift, the filling line is washed-down, has a caustic foaming agent applied to kill bacteria and then is final rinsed. The caustic foaming agent was destroying – literally eating – the aluminum shaft supports while shafting exhibited pitting and showed signs of minor corrosion. Additionally, there were areas where product got trapped and these locations were havens for bacterial growth. Because this system was in-place and our customer was the end-user, LM76 engineers had to use direct drop-in replacement com¬ponents. What to do? 1. We applied a ceramic coating to the aluminum “T” support. This coating is FDA compliant, is file hard (resists scratching) and is highly corrosion resistant. 2. To enhance system flushing to remove trapped product that could produce harmful bacteria, we segmented the support system to allow for proper evacuation of all washdown solutions and debris. 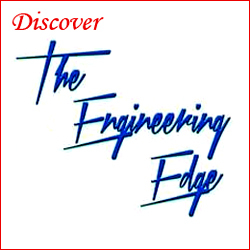 « Linear Bearing Engineers Design Camera Sliders for the Pro and Beginner!